A few weeks ago, members of the Library Development Bureau trekked to the town of Mountainair to visit their public library. The library is run by the Director, Evelyn Walker, and a bunch of volunteers (there’s a waiting list of volunteers all biding their time until they get a coveted spot in the library!). 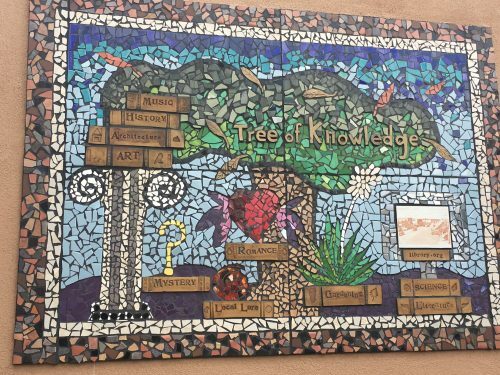 The most striking part of the library is a beautiful tile mosaic. If you’re even in the Manzano Mountains, definitely stop by the library and check it out! Later this month the town will be holding it’s annual Sunflower Festival which sounds like a fun time!